After a relatively quiet first half of the year, the craft/design calender is filling up pretty fast. And as usual, we endeavor to bring you all the details that pertain to these market access events. P.S These events are not listed in any order whatsoever. Since 1976, the Christmas Fair has been showcasing the best of Africa’s art and craft- last year hosting exhibitors from as far of as Zimbabwe. 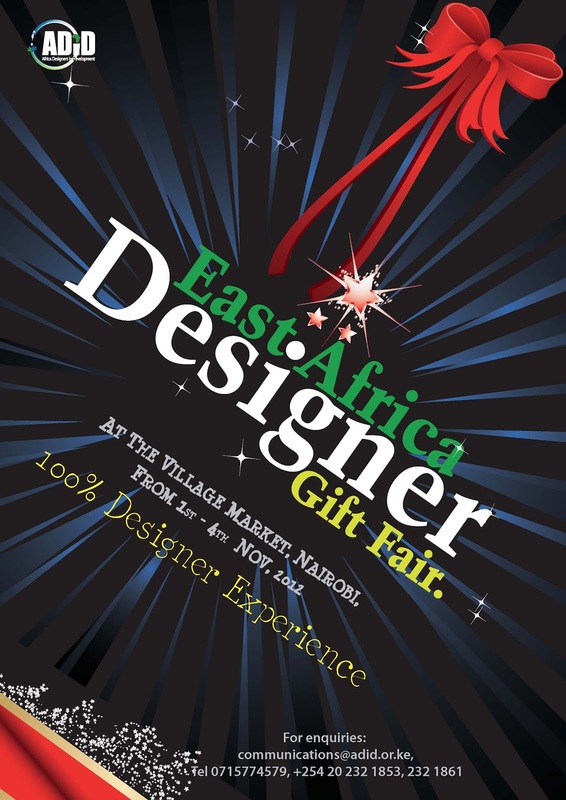 It is arguably the biggest and oldest craft fair around- and this year they are back on 7 & 8December2013 at the Ngong Racecourse. Applications are currently ongoing. See website on how to participate. 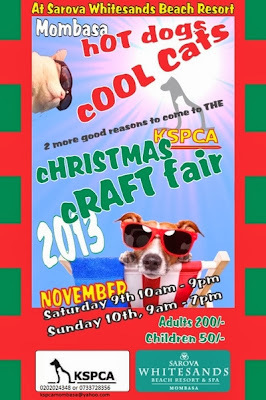 Organized by BizBaz Events, this craft fair happens 16 &17November 2013 at Karura Forest. For details on bookings email info@bizbazevents.com or call 0701 395 902. Look out for the revamped website, as you can register online once it is up. Organized by Geraldine and Deborah Evans, this is one of the smaller yet busiest craft fairs in Nairobi. All gate and raffle proceeds go to ANDREF, and this year the event will be held at 12 Bendera Lane, Spring Valley on 30Nov-1December2013. The email address you need is zawadiafrica@gmail.com or 0721 307 232, 0722 510 932. This boutique event happens over three days; 22-24November 2013 at Marula Manor in Karen. With tent charges varying from 30-105,000 shillings, this promises to be an exclusive event. Email info@thebox.co.ke or see the website. 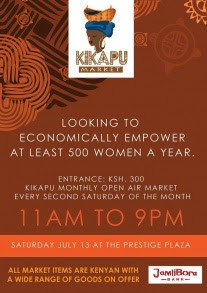 The Kikapu Market is a monthly open air market that takes place every second Saturday of the month from 11am to 9pm. The July market just happened this past weekend at Prestige Plaza. To get a slot in the August market, contact kikapumarket@gmail.com, 0723 387 134. Also be sure to check out their Facebook page. Fashion With A Difference This annual fashion is planned to coincide with Kenya’s 50years of independence, with the theme being ‘united colors of diversity’, based on the cultural and ethnic diversity of Kenya. There will be a number of fashion & arts market stalls for exhibitors. If interested in showcasing- info@fashionwithadifference.com, 0705 607224 or check out website. This is a special themed showcase for producers in the recycled/upcycled sub sector. It happens every first and last Tuesday of the month at the Village Market, Gigiri. 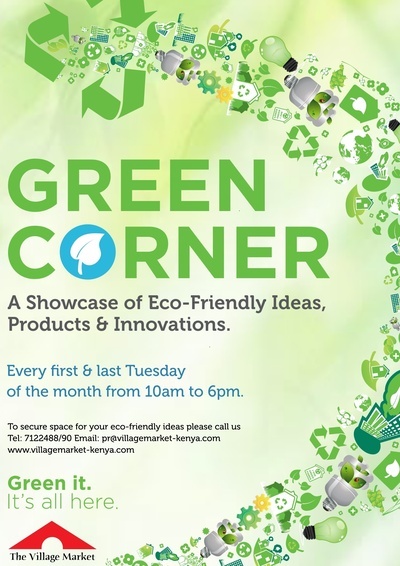 For more information on how to participate – pr@villagemarket-kenya.com, 020 712 2488/2490, www.villagemarket-kenya.com. The Yaya Soko is back after a short hiatus. Curated by Mary Stannah of Inside the Baobab (craft shop at the Yaya Centre), the soko happens once a month- over 4 days (Thursday-Sunday), the third week of every month. Cost for the four days is 7500Kshs. 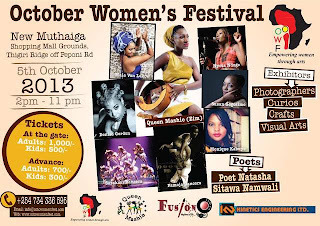 October Women Festival The one day October Women Festival happens at Karura Forest, 2November 2013, 2-11pm. 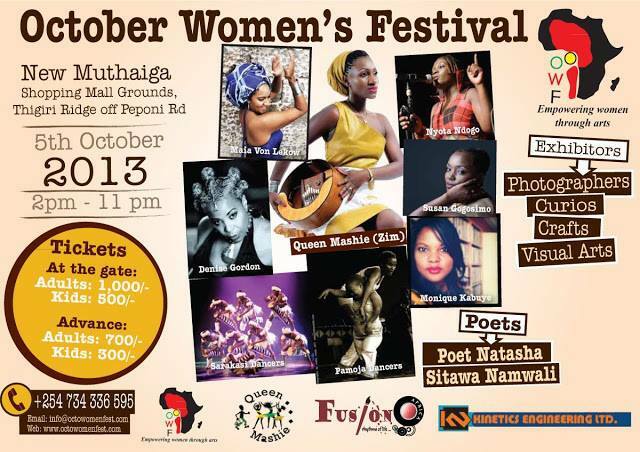 Put together by Queen Mashie, the event aims at celebrating talent in women. See the website for details on how to apply or call 0726 130 657. The playground for the big boys and girls of design… An annual event held in Capetown South Africa, Design Indaba has easily become Africa’s foremost design event. Applications are now invited for exhibitors to the Design Indaba Expo 2014, running from 28February- 2March 2014. All details on the how, when, where available here. Vipingo Ridge will once again host a Christimas craft fair on 14December2013, 10am till late. Check out Vipingo Ridge on facebook. Once again the German Embassy will play host to the annual charity event. Venue will be at Riverside Drive 113 and the date to remember is 30November13. Rates for tables start at 3000Kshs. Get in touch – 020 4443262, office@kirchenairobi.org. The office requests that you observe office hours while doing so i.e Mon, Wed, Thurs [0830-1330hrs] and Tue, Fri [0930-1530hrs]. The KSPCA dog show is happening Sunday November 3rd at the Ngong Race course, 10am onwards. There will be a craft market running alongside the main agenda of the day- a dog show. Contact info@kspca-kenya.org, 0733-571125. « I Will Be a Humming Bird	» Are You Running A Business or Pursuing A Hobby? Let me firstly thank you profusely for providing such valuable information in one post. It has really really helped me in terms of networking and exposing my brand in so many other avenues. Thanks for your comment. Its unfortunate about your experience with the contact person at the German Embassy. You are the second person to tell me about the rude encounter. I will take up this matter with the organizers. Will keep you posted. Thank you so much for your information. I viewed the first part of this post once, is it possible to access the info elsewhere? i will be very grateful. Unfortunately no- what exact information were you looking for? I just participated in my first fair at the recently concluded Spring Valley Bazaar. I found out about it purely by accident on Facebook, and it turned out to be a superb experience. I am happy that you are providing this information, since now I know I shall use it for the 2014 fair season. Thank you very much! Thank you Eric! We are happy to be of service.